Customized hunter green & white 32” golf bag umbrellas are largely seen during the golf matches because it closely synchronizes with the colors of green gold turf and overall it generates eclectic visual appeal. Logoed promotional hunter green & white 32” golf bag umbrellas are hugely appointed by sports accessories manufacturers, television channels to show their affiliation with the event or their niche presence. Personalized hunter green & white 32” golf bag umbrellas stand higher chances of retention at players end because it shelters their accessories during the game and they can rely on it on any stormy day. 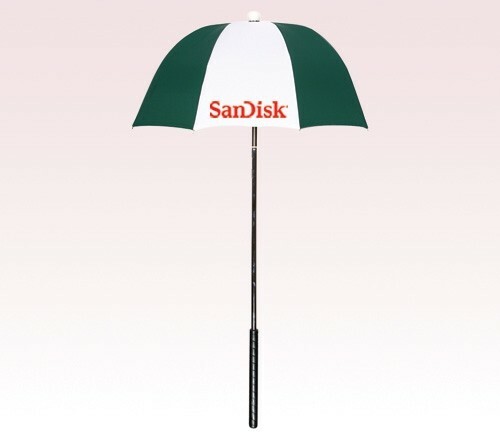 This manual open umbrella features a sturdy handle, and 32 inch hunter green and white nylon fabric canopy. Dimensions - 32" arc - Closes to 41". Imprint Area - 4"W x 4"H.